The entire Pi Dozer in enclosed in a classic Macintosh Plus case. I had previously gutted out the contents of the mac. The Pi Dozer main brain is the Raspberry pi which has a servo and LED connected to it. The servo is connected to a rod which attached to a piece of acrylic. The servo and Lever attached to the servo are on a sheet of acrylic which is 2 inches elevated from the bottom of the mac floor. The coins fall from a slot which is located on the top of the mac. 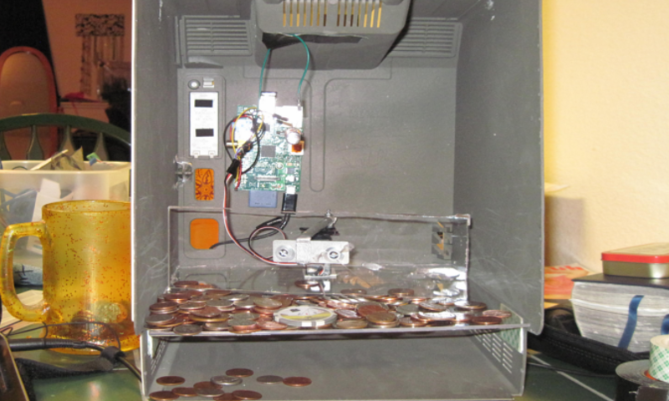 As the motor pushes the coins near the edge as coins fall of the acrylic bottom they are captured underneath (shown below). There is also another slot on the face of the mac which allows coins to come out (WINNER, WINNER! Chicken Dinner!). The lever pushing some coins into the slot and trap underneath the slide on the Raspberry Pi Dozer. The face plate is off revealing the undercarriage which captures the coins within the Raspberry Pi Dozer. Pi Dozer with the Face on. Underneath the Mac Plus logo is where the slot is that the pennies fall from when pushed by the servo and lever. Top view of the Pi Dozer case showing the insert coin slots. Python code that runs the servo motor for the Pi Dozer. Video of the Pi Dozer in Action. I remote into the Raspberry pi over VPN. Then execute the script which activates the servo. With a slide show of the case at the end.